It is important to do regular backups. It is also advisable to store the backup file on another device in a separate location. To do a backup the database, or to change your backup settings, go to Manager > Tools > Database Tools > Backup Database. The backup folder is the folder where the backup files will be saved. Do not use a user folder (see below). If you want the system to do automatic backups daily, check the 'Do automatic backups' box. The backup will be done first thing in the morning or as soon as the first ROBOTILL application (Manager, Retail or Restaurant) is opened on that day. You can choose how many backup files you want to keep. If you select 5 for instance, only the last 5 backup files will be kept and any older backup files will be deleted by the system. Note that automatic backups needs to be enabled for this feature to work. Keeping the last several days of backup files is a good idea - if for example you updated stock from a file but only realized you made a mistake after a backup was done, then the latest backup will be of no use. To do a backup now, select the Backup button. The settings will also be updated. To only update the settings, click the 'Update Only' button. Remember to copy your backup files to another device or to the cloud in case you have a hard drive failure or your computer gets stolen. 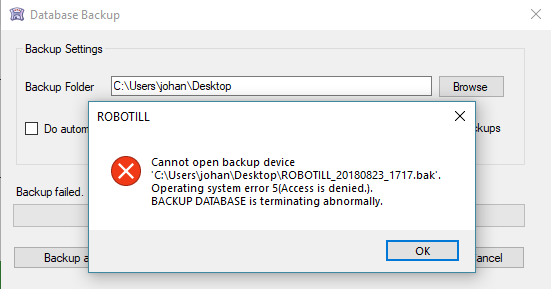 The backup folder cannot be in user specific folders like Documents or the Desktop. Create a folder out of your C drive (or another drive) to use for backups. For example: C:\Backups.